Photos courtesy of John M. P. Knox. Check out his other photos at http://www.flickr.com/photos/jmpk/! 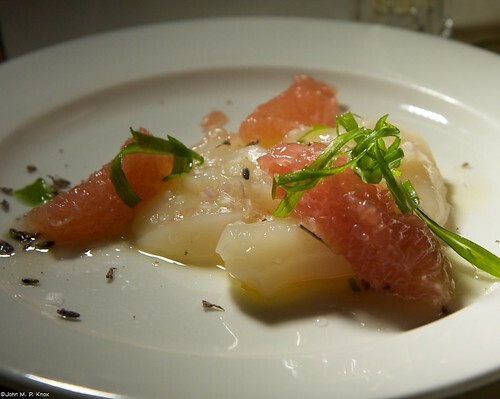 On Wednesday evening Tipsy Pisst and I attended a chef’s table dinner at Fino Restaurant here in Austin. As I am sort of scared of strangers I was a bit leery of sitting at a big table with a bunch of people I didn’t know and being expected to make conversation. However, part way through the first of Bill Norris’s excellent cocktails this ceased to be a problem as I realized we were surrounded by cocktail and food geeks and liquor industry folks and that the expected conversation would mostly be on topics that I have no trouble babbling incessantly about. 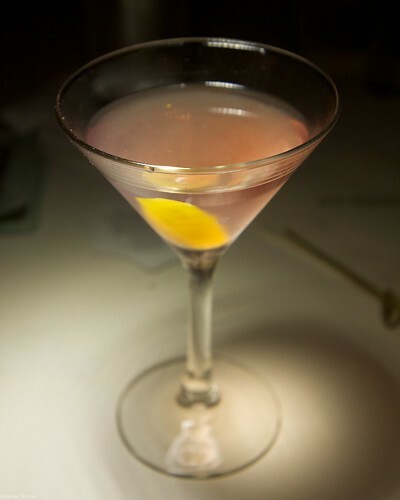 The theme for the evening was St. Germain liqueur, a fairly recent addition to the spirits universe from Cooper Spirits which seems to be everywhere these days. It is also pretty much Tipsy’s favorite libation ingredient. 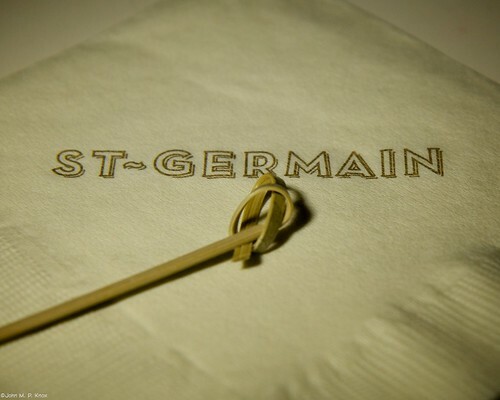 We were lucky to have Bryan Townsend, Texas state sales manager for St. Germain, at the table, so we got to hear a lot about this amazing stuff and the company that is producing it. 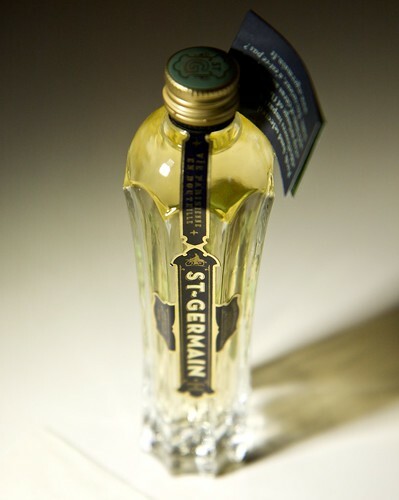 You can head over to their website for details on this unusual liqueur’s history and production, but in brief: St Germain is a cordial made primarily from elderflower. It is only 40 proof and has a very delicate flavor (and is quite sweet) that hints at apricot, pear and something undefinable. Once a year little old men on bicycles in a small area of France ride around and harvest elderflower blossoms which are used to produce that year’s batch of St. Germain. It really is pretty amazing, and if you haven’t tried it yet, you should. Stir together sherry, elderflower liqueur, and bitters over ice and strain into a sherry glass. Garnish with lemon twist and serve. The Fino version differed in how it was served (over ice as opposed to strained) as well as perhaps in the choice of sherry, which was described as fino sherry on the menu. This drink was paired with some snacks, including some house-made potato chips and dip which I don’t recall the details of, except that they were tasty. At one point we were served some of Fino’s life-changing anchovy stuffed fried olives, one of my very favorite foods on the whole damn earth. Eat them now. Next up, the Paloma Flower (I believe this is a Bill Norris original) a flip style drink made with Siembra Azul Reposado tequila, grapefruit, St. Germain, Egg White and house-made grapefruit bitters. My memory of this drink is somewhat sketchy, but I do recall that it paired well with the scallops (which were lovely) and that the reposado tequila added a very nice complexity to the drink. The grapefruit bitters (which I previously misidentified as Bitter Truth) went very well here, helping to bring the grapefruit juice and St. Germain together in one big happy. The second course was an incredible white gazpacho, apparently an adaptation of a very old Spanish recipe. Bread, olive oil, a bit of garlic…simple and wonderful. 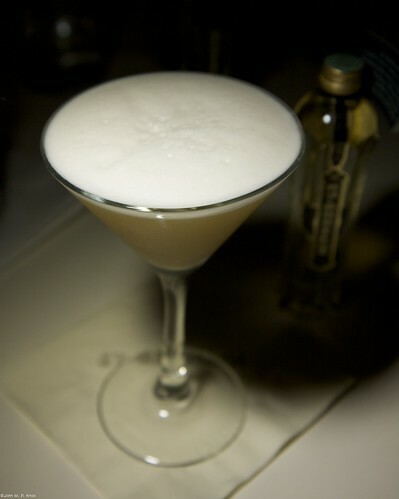 It was garnished with green grapes and marcona almonds and went very well with this round’s cocktail: the Cedar Fever. 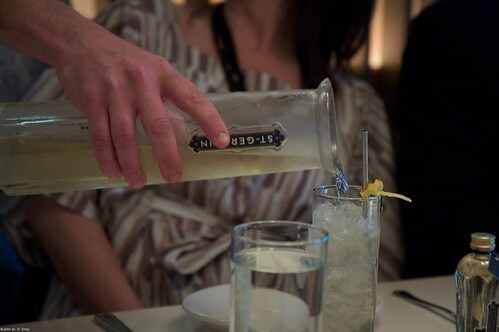 The Cedar Fever has been a constant on Fino’s cocktail menu for a while now and is unusual, challenging, and very tasty. Old Tom Gin (Hayman’s), St. Germain, Zirbenz Stone Pine, and Peychaud’s bitters… this drink should be a giant mess but isn’t, instead it ends up tasting like my favorite camping trips. Or at least my memory of them, probably not the reality. Anyway, it is very good and I highly recommend trying it. If I can get a recipe sometime I will definitely post it here. Third course, the cocktail was the Scotch Surprise. Tipsy Pisst and I both agreed this was the stand out cocktail of the evening. We liked it so much we both ordered it the next night when we ended up at Fino again for a friend’s birthday celebration (yes, I know, we have a problem). Dewar’s, St. Germain, Grenadine (Fino house-made), lemon, and Bitter Truth mole bitters. This concoction was complicated but easy to enjoy with a bit of smoke, flowers and all sorts of citrus without making anyone pucker. Very, very nice. 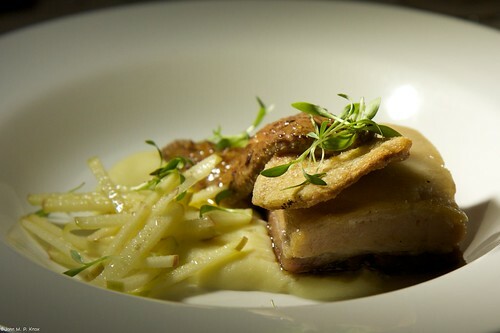 It was paired with an incredible pork belly confit with seared foie gras and julienned apples. The dessert course beverage was simple, just chilled St. Germain, which is very nice on its own. Sipped, it reminded me (and not only me) of a Sauternes, so it would probably go well with that foie gras we had just finished. As it was, we had to drink it with some fantastic cupcakes created by Jenny Chen (MisoHungry) in a fit of St. Germain inspired culinary artistry. You can read more about her Tipsy Ispahan Cupcakes here, in her words they are “Amaretto cake, brushed with rose water, filled with Lychees and Raspberries, topped with St. Germain Buttercream”. They were great, and we got to take a couple extra home for emergencies. All in all a very tasty, tipsy and informative evening. One great thing about the Chef’s table at Fino (this was our first time) was having the likes of Bill Norris (the drinkmaster at Fino) and Jason Donoho (the executive chef) on hand and willing to expound upon their creations, or even just chat about food, drink, and sundry related topics. We will definitely be back. 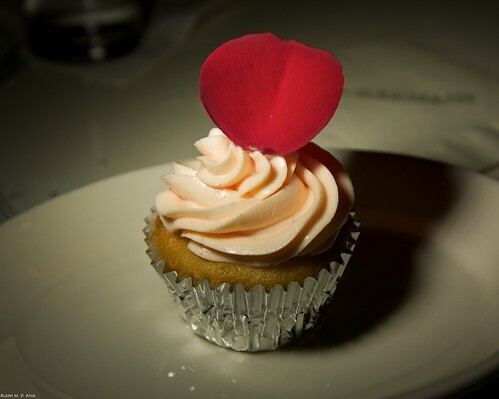 Thanks again to Fino, St. Germain, MisoHungry for the cupcakes, and John Knox for the awesome photography. Check out the rest of his set from this dinner.